Etihad Airways, the official airline partner of the Special Olympics World Summer Games, has flown the Australian team of athletes, coaches and volunteers across the globe to the UAE’s capital, Abu Dhabi to compete in the World Games. Departing on flight EY 451 overnight from Sydney, the group of 105 athletes will participate in more than 11 sporting disciplines, including basketball, swimming, football and tennis, in front of half a million spectators for seven days from 14-21 March 2019. 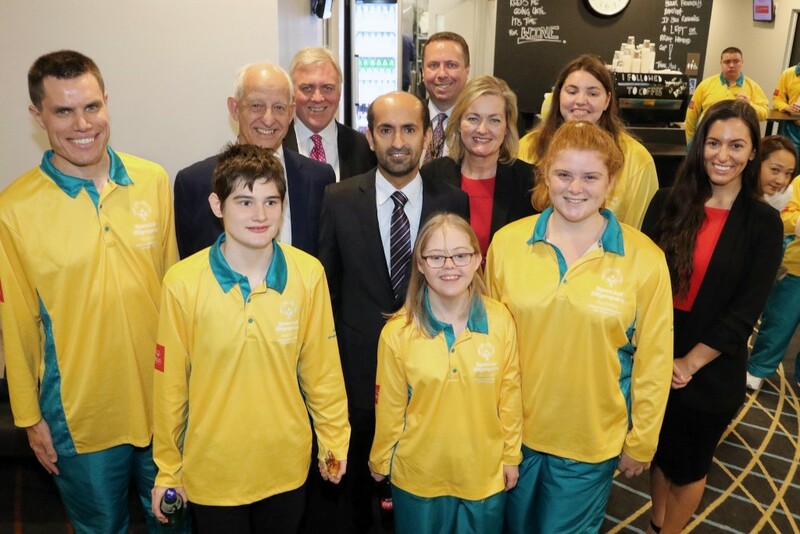 Etihad General Manager Australia and New Zealand, Sarah Built joined Governor-General of the Commonwealth of Australia, Sir Peter Cosgrove and other dedicated supporters of the Special Olympics Australia team to bid farewell to the Australian team on Thursday. “Special Olympics World Games Abu Dhabi 2019 is the largest sports and humanitarian event in the world this year,” Built said. “Here at Etihad, we see a truly remarkable opportunity to provide a platform to connect with people through sports, inclusively. “We are proud to support the Special Olympics which deserves more awareness. It has been incredibly humbling for our business to support both a fantastic cause and the many talented individuals representing Australia as they prepare for this life-changing event. Special Olympics CEO Corene Strauss said Etihad has embraced the most marginalised and misunderstood community in the nation. “Over the years, it has proven immensely challenging to secure support for our organisation which provides a year-round sports program for all people with an intellectual disability which pinnacles at the World Games,” Strauss said. Etihad has developed a wide programme of support and engagement in the lead-up, during and after the Special Olympics World Summer Games, including an innovative e-learning course to enhance staff members’ awareness and understanding of people with intellectual disabilities. Additionally, the airlines’ award-winning Cabin Crew have undertaken specialised training to ensure they are prepared to assist athletes, their families and supporters throughout their journey. Etihad is also encouraging Etihad Guest loyalty programme members to donate frequent flyer miles to help provide athletes with accommodation, food, transport, special events and dedicated facilities at the World Games. As of March 4, more than 490,000 miles have been donated. Built said that the airline has taken its support to new heights with a striking new livery in recognition of the greatness of the World Games, conveying a message of hope and inclusion.